How to travel so that you arrive looking good and feeling good? As the author of The Globetrotter’s Get-Gorgeous Guide, I can think of no better way than to fly on Emirates Airline, which in 2013 was named the world’s best airline by Skytrax. Today, March 10, 2014, the lauded airline launched Boston-to-Dubai service, and my husband Bill and I attended the press conference at Boston’s Logan Airport. In attendance was Massachusetts Governor Deval Patrick, along with Sir Timothy Clark, the President of Emirates Airline, and a wealth of media. Also present were some of Emirates Airline’s flight attendants, who were beautifully attired in beige suits with red headgear. 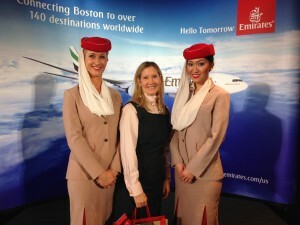 Their hats also features scarves with seven pleats – signaling the seven emirates. After the celebrated landing of the Boeing 777 at Logan Airport – complete with water cannons—we did a static tour of the plane. The most amazing features of this appealing aircraft are the eight sleeper suites in First Class, which even have remote-control-operated door panels that side shut – for sybaritic slumber. Each of these private compartments offers a comfortable flatbed decked out with luxury sheets and pillow, slippers, pajamas and eye shades, along with a compartment for beverages, a basket of snacks, and boxed stationery. First Class male and female passengers – who must pay $12,000 per person for a roundtrip flight from Boston to Dubai – also receive lovely amenity kits from prestige brand Bulgari, featuring all kinds of creams, perfume and toothpaste. My favorite element of the suites is the adorable mirror outlined with lights – a Lilliputian luxury similar to what you’d find in a movie star’s dressing room. It is embedded into the suite’s countertop, and also contains products from Temple spa featuring “sniff boxes” to put you to sleep – or wake you up. Business class suites are also posh, and while each seat doesn’t have doors as does First Class, you’ll also be cradled in comfort. Amenities in all classes – including coach — include multi-course meals and a range of complimentary drinks, personal widescreens featuring more than 1,600 channels, noise-cancelling headphones, auto-adjusted lighting to reduce jet lag, and in-seat laptop power supply. In Dubai, in Emirates Airline’s First Class Lounge, passengers can also enjoy a range of spa services in its Timeless Spas, where you can enjoy a massage or a beauty treatment.